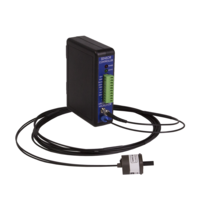 Micronor’s MR430 Size 11 Fiber Optic Absolute Encoder comes in Ø1.1 in. form factor that is designed for small robotic and actuator mechanism. The encoder system consists of MR430-1 DIN Rail Mount Controller and MR431 rotary sensor. The unit provides a resolution of 25-bit and update rate of 850 µs and is suitable for mission critical and position-dependent applications. The sensor offers magnetic immunity and transparency for MRI applications. Camarillo, CA – May 25, 2018 – At Sensors Expo 2018 (June 27-28, San Jose, CA USA), Micronor will unveil the MR430 Size 11 Fiber Optic Position Sensor System, the world’s smallest fiber optic absolute rotary encoder. The innovative sensor is based on Plastic Optical Fiber (POF) technology that achieves a new sweet spot for size, cost, and performance, for the many challenging applications and potential designs that could not formerly justify using fiber optic sensor technology. This passive, EMI-immune position feedback solution is ideal for operating environments stressed by High Voltage, RFI, Microwave Radiation, Magnetic Fields or Explosive Atmospheres. In size, the MR430 sensor features a miniature Size 11 (Ø1.1”) form factor suitable for the smallest robotic or actuator mechanism. In performance, the encoder offers 25-bit resolution (13-bit Single Turn + 12-bit Multi-turn) with an update rate of 850µs and ability to operate interference-free over distances up to 30 meters (100 ft). In cost, the use of inexpensive POF cabling optics achieves a price point less than prior glass fiber-based absolute encoders. The sensor’s non-metallic construction offers both magnetic immunity and transparency for MRI applications as well as superior corrosion resistance for the harshest industrial environment. Insulated bucket and boom trucks where high voltage immunity is required. MR430 encoders can monitor yaw, articulation and boom extension to provide automated, multidimensional situational awareness for enhanced operator safety. Substation transformers also require high voltage immunity. The passive, non-metallic sensor can be mounted within the transformer to directly monitor tap changer position. Dynamic MRI phantoms, designed for medical training and simulation, require both immunity and transparency to magnetic fields. The non-metallic encoder can be operated in the MRI bore and will not leave features in the MRI scan. MRI-guided biopsy and surgical robots require the same “magnetic invisibility” as phantoms. Robotic systems require accuracy, repeatability and real-time position feedback. Orbital welding systems and welding robots require EMI and High Voltage immunity. The MR430 is unaffected by plasma and electrical discharges which create interference and damage conventional electronic-based encoders. Valve position monitoring in petrochemical plants and refineries require that the equipment be safe for use in Explosive Atmospheres. The MR430 sensor system is classified Inherently Safe, consisting of the “simple mechanical device” MR431 sensor with “inherently safe, optical radiation” sourced by the remotely MR430 Controller. Robotic and material handling applications operating in hazardous areas such as mines, grain elevators and food processing. The inherently safe MR430 encoder system is ATEX compliant, and can be used safely in all manner of mines and combustible gas, vapor and dust environment. On Wednesday, June 22, 2018 at 2:00pm, Micronor will be presenting a live product demonstration in the Sensors Expo Live Theater. Since 2003, Micronor Inc. has been a pioneer of innovative Fiber Optic Kinetic Sensors for both industrial and medical applications. Products include Fiber Optic Position Sensors, Rotary Encoders, Linear Encoders, Signaling and Temperature Sensors. These sensors are designed for challenging applications where immunity to EMI, RFI, microwaves, high voltage, magnetic fields, radiation and/or explosive atmospheres is required, as well as MRI compatibility or long distance operation. Micronor maintains regional sales, service, engineering, and manufacturing facilities in both California, USA and Regensdorf, Switzerland.